Festival make up *rather over make up :P* gets us really thinking after we wipe it off. :-/ The blemishes, the acne scars, the pigmented patches, the dark circles look even more in your face and prominent after wiping off the flawless concealers and highlighters and its that which finally got me into thinking that I have got to invest less in makeup, more on skincare! ‘cause practically speaking, if you have awful skin, no amount of makeup can eventually make you look glowing and radiant! 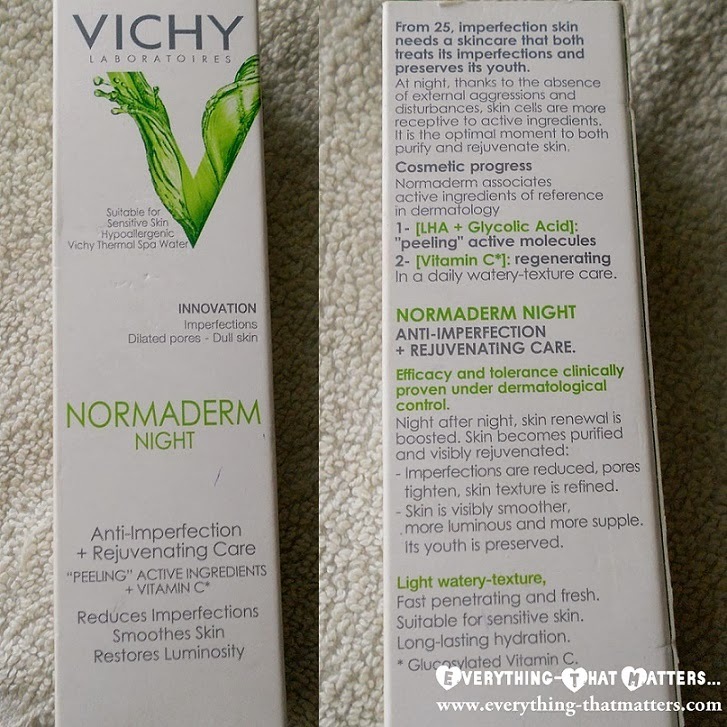 I badly needed a night cream after going through mynatures co. one *I got bored of it and mom took it :P* , so read up on a few things and zeroed in onto the so hyped vichy normaderm range 😀 This range has 2 night creams. One is Vichy Normaderm Nuit Anti- Imperfection Care that is already reviewed on ETM, mine is the other. From the age of 25, skin needs skin care that both treats its imperfections and preserves its youth. At night, in the absence of external environmental aggressions and disturbances, skin cells are more receptive to active ingredients. It is the optimal moment to purify and rejuvenate skin. Vichy Normaderm has the goodness of LHA and Glycolic acid that have a ‘peeling effect’ on skin and Vitamin C that regenerates skin. Night after night skin renewal is boosted. Skin becomes purified and visibly rejuvenated. Imperfections are reduced, pores tighten, skin texture is refined. Skin is visibly smoother, more luminous and more supple. Its youth is preserved. Light skin texture. Fast penetrating and fresh. Suitable for sensitive skin. Long-lasting hydration. Apply every night with your anti-imperfection routine, on a clean face. “Peeling” active ingredients (LHA + Glycolic acid) + rejuvenating vitamine C* (* : glycosilated vitamine C). Aqua / Water• Alcohol Denat • Glycerin • Dimethicone • Pentaerythrityl Tetraethylhexanoate • PEG-20 Sterate • Cetyl Alcohol • Nylon-12 • Paraffin • Slica • Kaolin • Ci 19140/Yellow 5 • CI 42090/Blue1 • Glyceryl Sterate • Zinc Gluconate •Glycolic acid • Triethanolamine • Dimethiconolte • Methylparaben • Tocopheryl Acetate • Ammonium Ploycaryldimethyltauramide / Ammonium Polycryloyldimrthyl taurate • Chlorphensin • Ascorbyl Glucoside • Capryloyl Salicylic Acid • Tetrasodium Edta • Butylene Glycol • Acrylates / C10-30 Alkyl Acrylate Crosspolymer • pa r f u m/Fragrance. The cream comes in a cute green tube packaging with a nozzle mouth for easy and non-messy dispensing of the product. 🙂 The product never accumulates around the mouth of the cap and the cute tube also makes it easy to carry. The product itself is a pale green in color which looks almost white and is oh-so light, fresh and non-greasy. 😀 It has a fresh cucumbery cool feel to it and as soon as you apply this on your face both your skin and senses are calmed a little runny, absorbed by the skin within moments and gives a light fresh matte finish ! It has the typical fresh fragrance of the entire normaderm range which I love! As for the effective part, does it work? Oh yes it does 😀 I picked this up after going through various night creams and their compositions because I wanted something with either glycolic acid or lactic acid as a key ingredient. Does not dry out or stretch the skin. The glycolic acid eats up the dead and dull skin, revealing glowing effects which are noticeable! None really except for the rapid escalation of price. :-/ Few months ago it was 750, now its 900 O-o..like WTH!!! That’s it for today pretties. 🙂 Hope the review was of use.